Home Economy Light at the end of the election? Light at the end of the election? The Merchantec CEO Confidence Index recorded an 11.6% decrease in CEO confidence in Q1 of 2019 to a score of 43.3 which is below the neutral score line of 50 points. The largest contributor to this decrease in confidence was economic conditions across all sectors. Consumer goods and technology sectors had the most significant drop in confidence this quarter. For the last year the same concerns have been expressed by CEO’s. The trend in comments remain the same for the last 4 quarterly surveys being, political uncertainty, lack of clarity from government on economic policies, concerns around Eskom & stability of power supply, rising cost of fuel, no significant gains in bringing the perpetrators of fraud to book, mixed messages from the ruling party regarding “the land issue” and the ambiguity surrounding the mining charter. Some CEO’s said that the election will not bring immediate change and that it will take at least a year for new policy implementation, for now they are just managing risk. The consensus view amongst CEO’s is that whilst everyone awaits the outcome of the election, consumer spending has halted, which has resulted in a knock-on effect on business confidence. 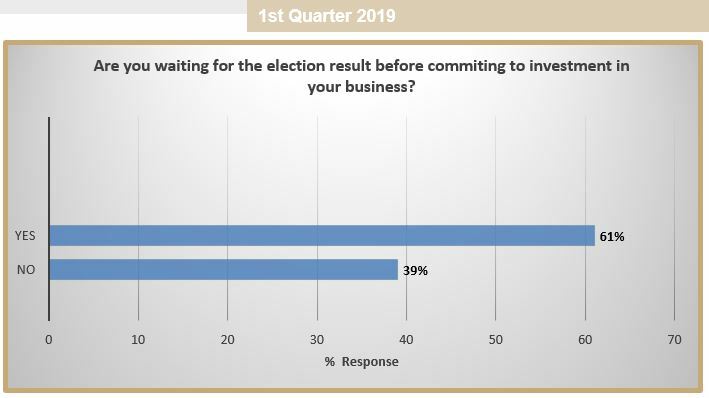 61% of CEO’s indicated that they are waiting for the outcome of the election before further investing in their businesses. 39% of CEO’s said they are not waiting for the results which eludes to a business as usual sentiment and/or indifference of CEO’s with the current state of SA’s political process. Basic Resources went down to a score of 52.50 points, a 4.5% decrease. Consumer Goods decreased by 21.3%, moving to a score of 40. The decrease in overall confidence was primarily driven by economic conditions and levels of planned investment. Consumer Services increased to 42.24 a 7.3% increase. Financials increased by 5.8%, this was mainly attributed to industry growth. Industrials decreased by 13%, moving to a score of 42.54 from 48.90 in Q4 of 2018. The decrease in overall confidence was primarily driven by economic conditions. Technology recorded the largest decrease of 41.6%, this was driven predominantly by economic conditions and the ability to secure debt. To view all previous quarterly reports, please visit Merchantec CEO Confidence Index. The Merchantec CEO Confidence Index, which consists of five components, collates views from CEOs of top South African companies and therefore provides a leading indicator into how business leaders perceive local market conditions and the economy going forward. The Merchantec CEO Confidence Index is a copyright report prepared quarterly by Merchantec Capital. The survey collates responses from over 1 000 top CEOs, from the listed and non-listed environment. Merchantec is a leading independent corporate finance, equity and debt sponsor, and research and business advisory company in South Africa, with offices in Johannesburg, Cape Town and Windhoek, Namibia. Our team will guide you through relevant regulations, giving you comprehensive advice, and helping you structure and implement the most complex business transactions, from JSE and NSX listings, to mergers and acquisitions, equity and debt capital raising, valuations, and BEE structuring. With our partner associations, we also offer corporate governance and secretarial services, as well as some of the most widely respected research reports in the industry. We will help you grow your business. Previous articleFinancial freedom: Will your daily decisions get you there?